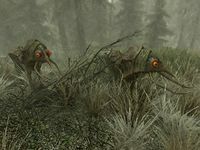 Nix-Hound is a Creation that adds Nix-Hounds to Solstheim, including one that can serve as your companion. It was released on April 5, 2018 for 200 CC Credits. This Creation adds Nix-Hounds to the island of Solstheim. While the majority are hostile enemies encountered in the wilderness, a tame Nix-Hound is available for purchase as a pet from Revus Sarvani (or Geldis Sadri if Revus is already dead). Upon installation, you will receive a notice of sale which will begin the quest My Pet Nix-Hound and will direct you to the relevant NPC to purchase the Nix-Hound for 400 gold.